On September 21, 2018, the MINERVA-II1 Rover-1A and 1B separated from Hayabusa2 and landed on asteroid Ryugu. The MINERVA-II1 team explored possible names for the landing site on the web and in other resources and selected the name “Trinitas” as the birthplace of the mythological goddess, Minerva. However, we later realized that “Tritonis” is the correct name for this location. Since the landing site name is a nickname used by the Project, it is not necessary to consult with the IAU as for names such as the “Urashima Crater” or “Otohime Saxum”, but we apologise for any confusion caused for anyone who recognized the destination name. Below is the revised figure for sites on asteroid Ryugu. 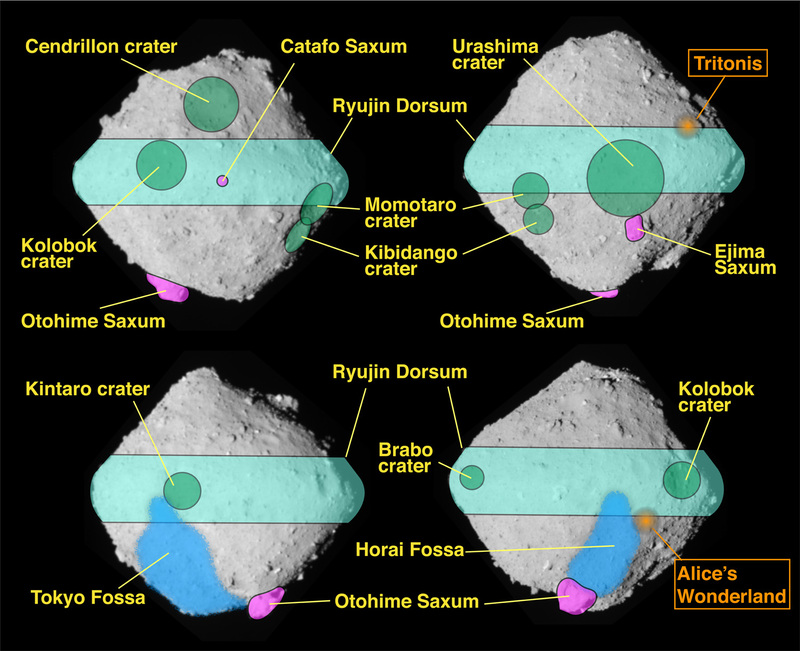 [open in another window] Figure 1: Map of the named locations on Ryugu. ※. The images of Ryugu are from the ONC team (JAXA, University of Tokyo, Kochi University, Rikkyo University, Nagoya University, Chiba Institute of Technology, Meiji University, University of Aizu, AIST).